Alright, I posted this monstrosity on this blog’s Facebook page earlier today after finding it at the Dollar General. If you haven’t liked the page, feel free to (right here). 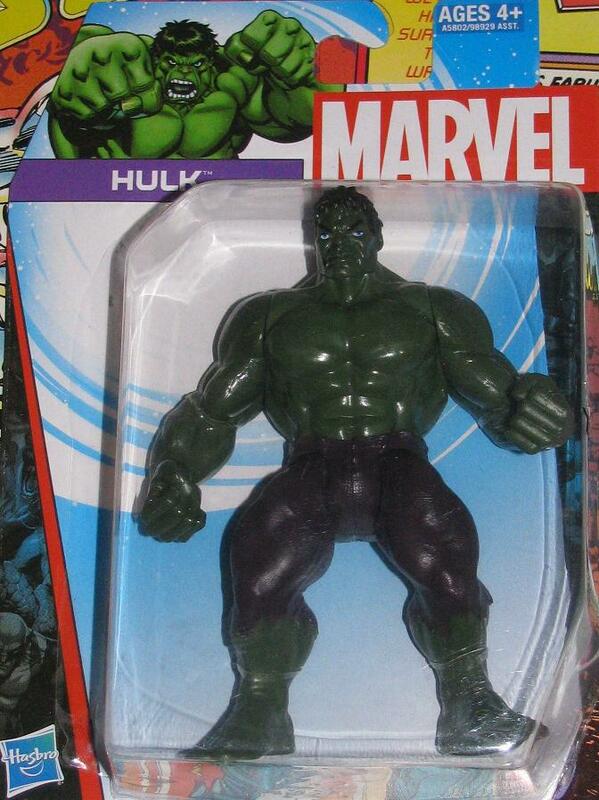 Don’t let the name of the store fool you – this horrendous, deformed version of the Hulk cost a whopping $7. I couldn’t help but pick this up but I felt ripped off even as I pulled the currency out of my wallet. Why would I buy such an expensive figure if I was totally unimpressed? Well, that’s easy. 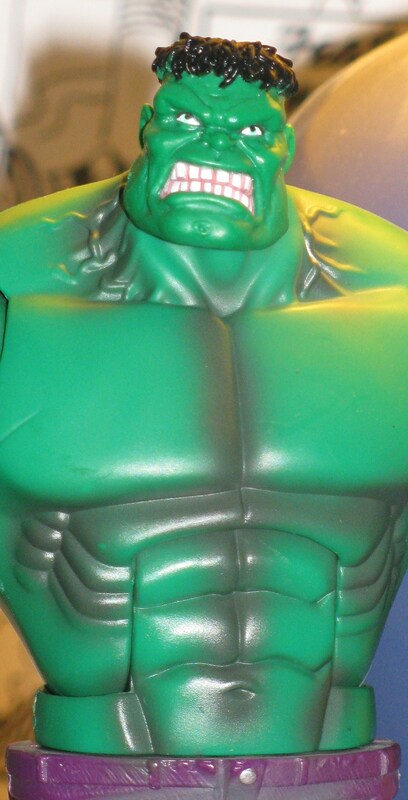 It’s the Hulk. In fact, that reason pretty much rules all of my purchasing decisions. This figure does have sort of a cool face – ruined by the googly eye. The very skinny body looks even more out of place when combined with the too short arm stubs that adorn this figure. 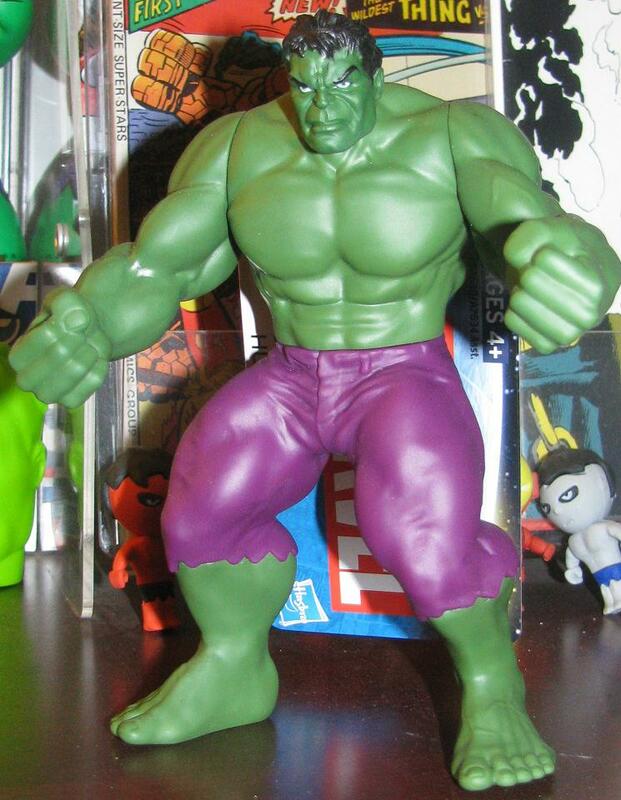 The very cheap paint job combined with the pretty much non-existent articulation means this figure is really not worth the hunt – unless you are sick in the head like me and feel a unexplained urge to buy everything Hulk! 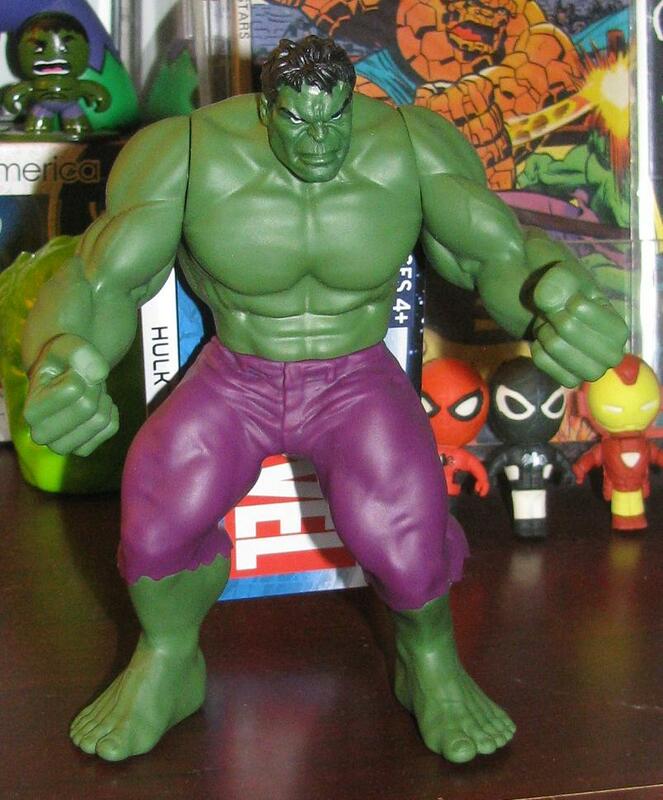 Obviously, this thing is just a larger version of the dollar store Hulk figure that was released this year. I do like the idea of these figures – most of the regular lines are geared towards collectors and have adult prices to boot. 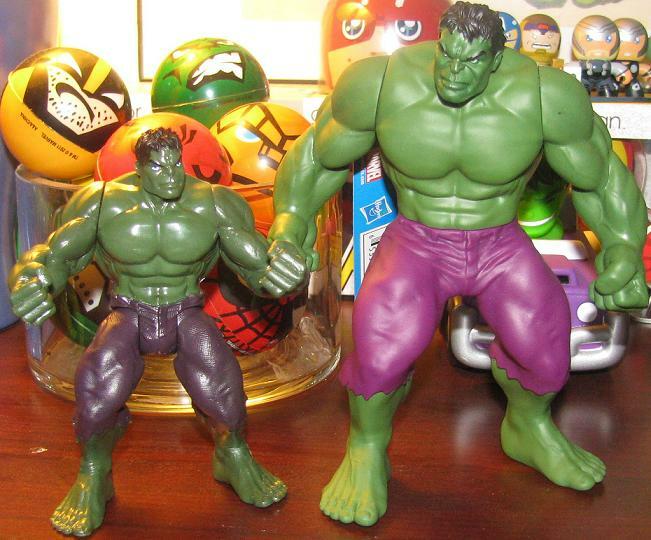 I know I have gone on this rant before so I won’t get into it again – but good on Marvel for bringing out cheaper figures for the younger crowd! 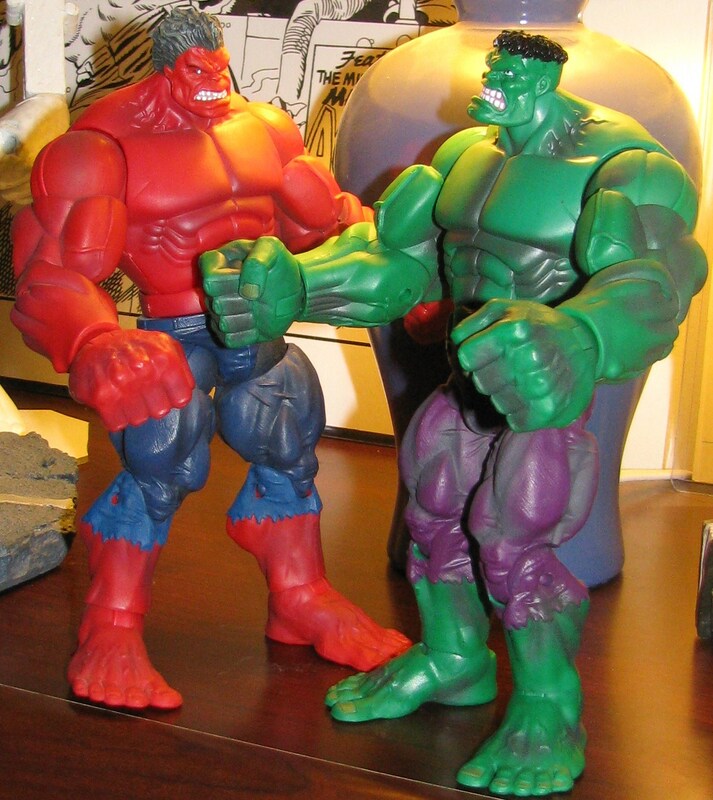 The 3″ figure is decent enough as it is – but this 6″ figure is the absolute bomb! 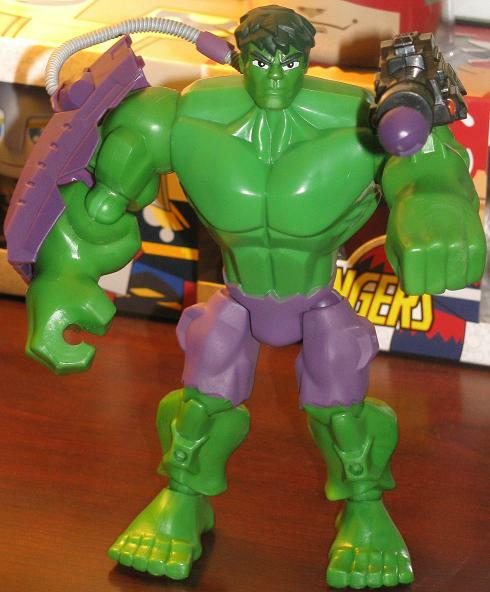 It doesn’t have the articulation that any Marvel Legends did but it does look pretty nice. It tops out at 4 joints (neck, waist and shoulders) but the sculpt is really fun. 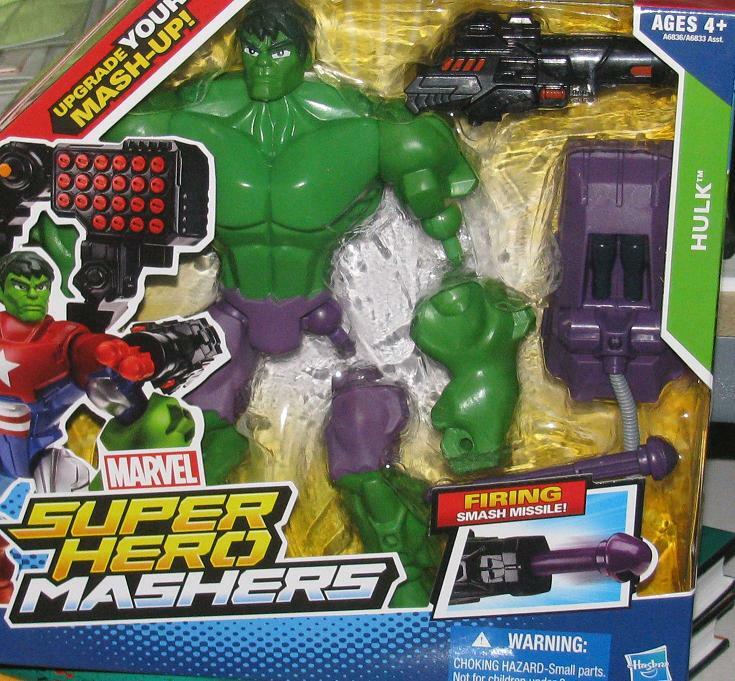 Today I bring you fine people the new Avenger’s Hulk Mashers. 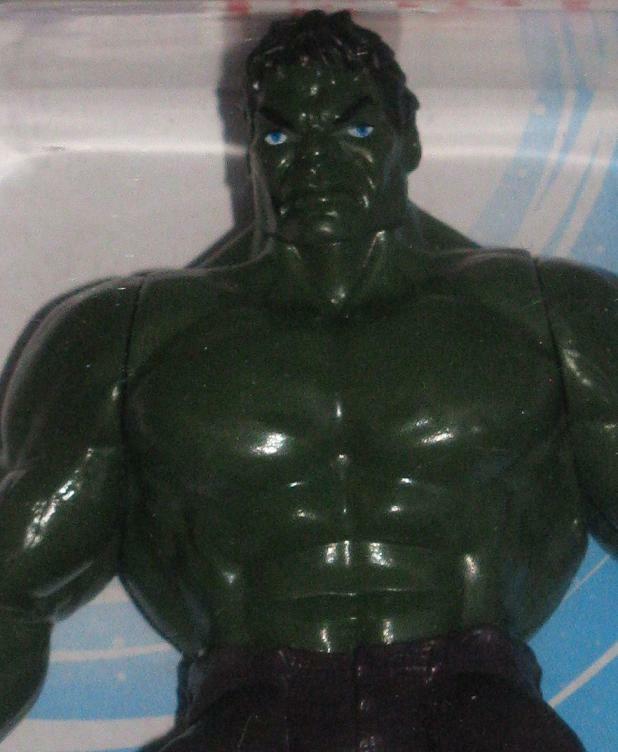 This is in a set of figures that have interchangeable parts that can make some funked up looking characters. 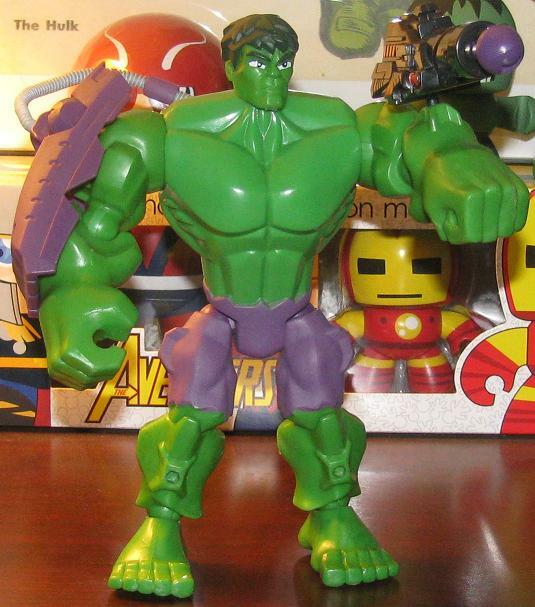 The Hulk with Caps’s arms? 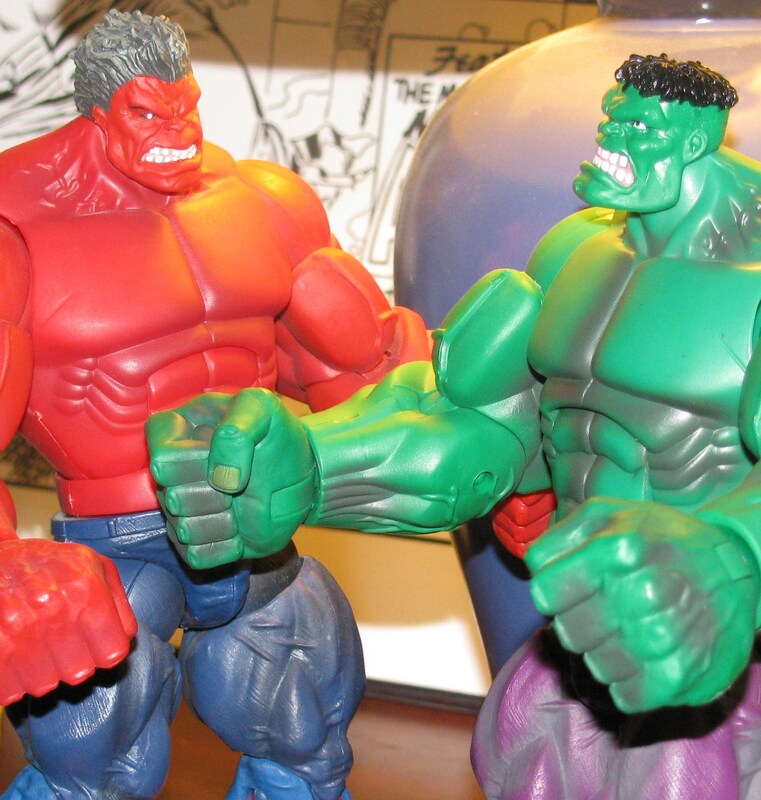 Thor’s leg and Iron Man’s… equipment? I mean you sort of have to ask yourself, “Why?” I am not so sure this was the way to go when you’re looking for new series to release. This figure comes with a few accessories, namely something that looks like a piece of armor attached by a hose and cannon that has a real firing projectile. 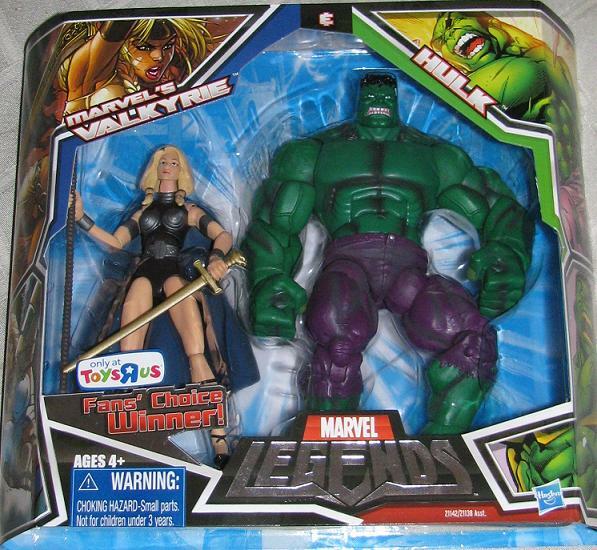 I didn’t think they made toys like that anymore – but alas I was proven wrong! 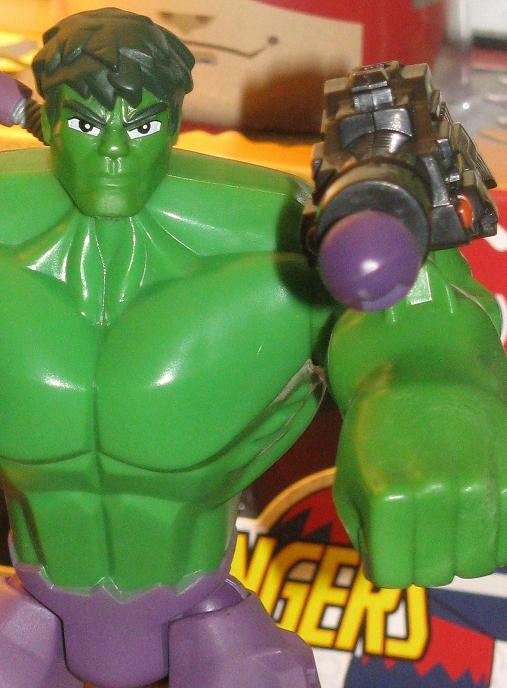 The action cannon makes up for the hokey theme of this series of figures. Overall, I do like this figure enough to recommend it to any other collector’s out there. The bottom of this figure says “Applause” and what looks like “1991”. Not sure where this figure came from – or if it’s from anything but it’s about 2 inches high and I’ve only seen it just once. 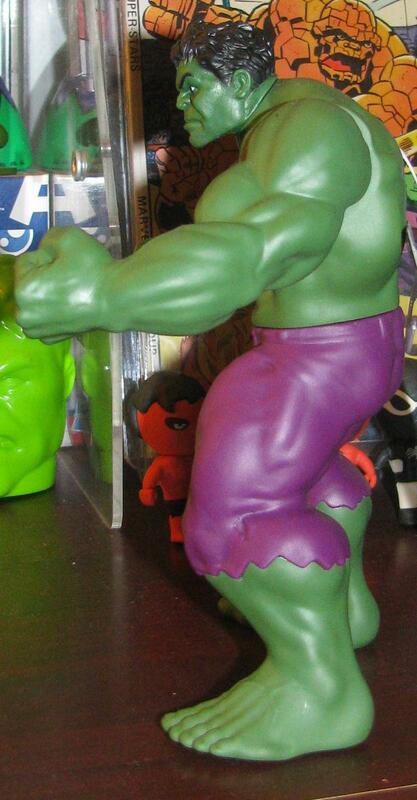 I thought I had all of the tiny Hulks out there but this one escaped me for too long! 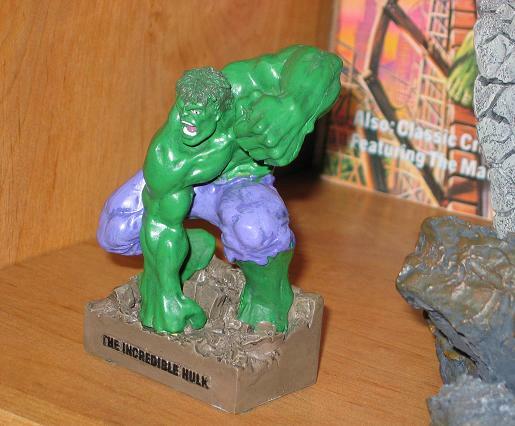 I found this at Bedrock Comics in Framingham at the time when I scooped up quite a few Hulk comics. I really love that shop – each time I go there it seems like I find something new which is really hard to do! 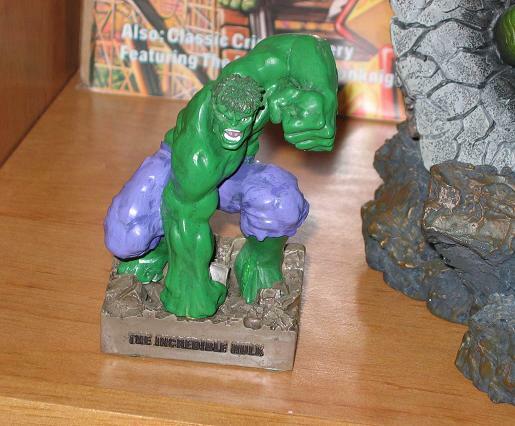 Most shops I visit have nothing new to offer in the Hulk realm – but this one does! Almost every time I visit! It’s made of solid plastic and – I’m amazed at what kind of detail they can make in these little guys – the rip in his pants, the rope around the waist, this little guy is just plain awesome! 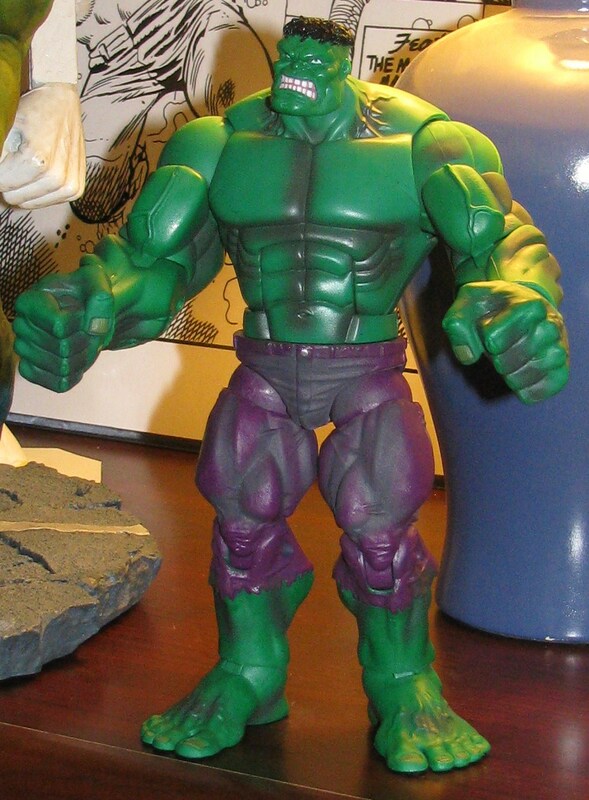 Maybe it’s because since the movie I haven’t really found any Hulk figures anymore – so I was probably more excited about getting this than I should be. 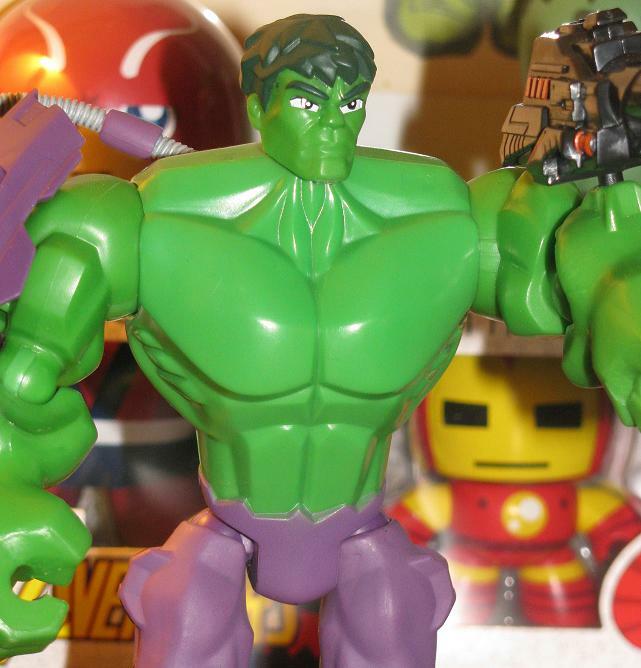 With how popular the MCP review was that I did yesterday – next week will be a full week dedicated to all of the Hulk’s appearances in the series! See you Monday! 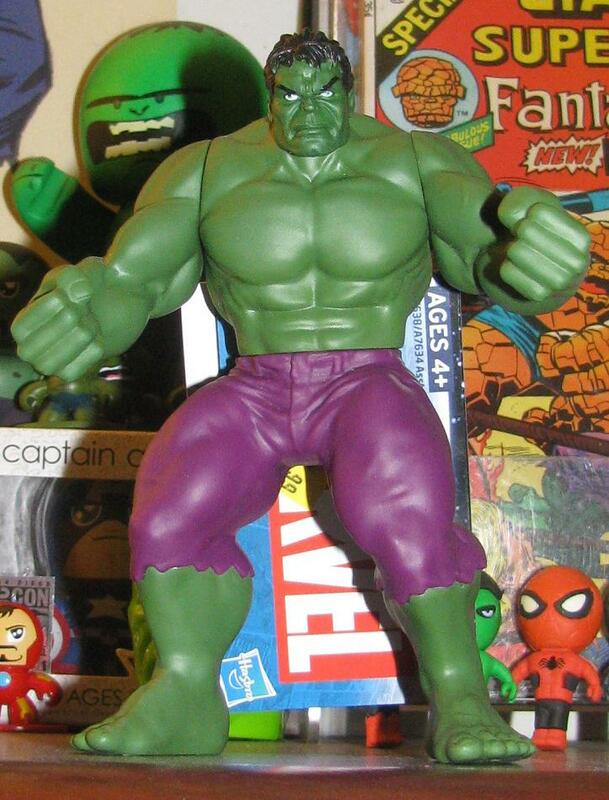 This little Hulk, and a few others out there that are like it, is a nice representation of the early savage Hulk. 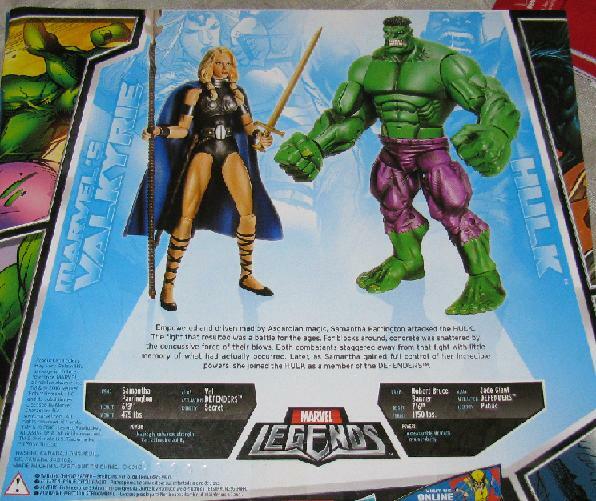 There are some stats on the back including the real name as Robert Bruce Banner, 6 Foot 6 Inches and 1,040 lbs. It also says his power is Super Human Strength. Not exactly wowing facts – but I do like the figure. There are a few others that are in some other poses – I think these were given with a book sold at Borders – but I am unsure.